Yangon (or formerly and more popularly known as Rangoon) was the capital of Myanmar until November 2005. Today, it remains the center of trade, commerce and tourism, as the largest city in the country with a population of over 5 million people. The city landscape and architecture reflect a wonderful harmony between local Burmese traditions and British, Chinese and Indian influences. Modern high-rise buildings began mushrooming in the 1990s, mixing urban development with traditional colonial architecture. To many westerners, Myanmar or Burma remains shrouded with decades of news about its past political and religious struggles. Rangoon used to be a leading international hub for trade, commerce and tourism until the military government took over and cut off the country from the rest of the world. Recently, this mystical Southeast Asian country has opened its arms to international tourism, showcasing its verdant natural resources (beaches, mountains, gardens and so on) and rich local culture and traditions, punctuated by ancient religious structures (temples, pagodas and stupas). 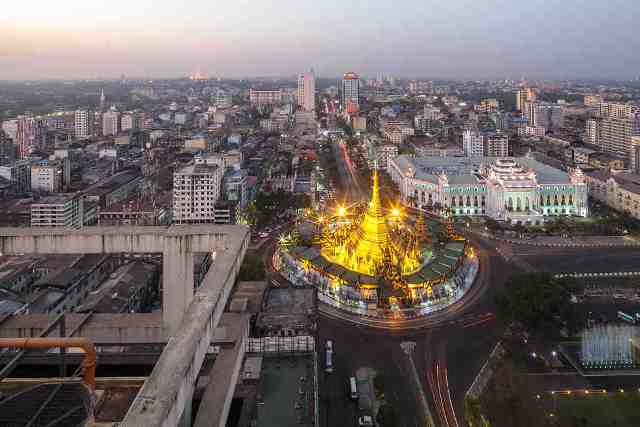 Yangon alone boasts of so many attractions that deserve global recognition. The city’s most recognizable landmark is the golden Shwedagon Pagoda. Ornamented with thousands of diamonds and rubies, Shwedagon is the most important pagoda in this country that has more than 5,000 modern and ancient pagodas, temples, shrines and stupas. According to local legend, the Shwedagon Pagoda was built about 2,500 years ago during the lifetime of the Buddha. Today, however, it is common knowledge that it was built much later, probably in the 6th century. The city itself is older than Shwedagon Pagoda, but Yangon gained importance only in recent history when British forces captured it after the Second Burmese War in 1852. Rangoon became the capital of British Burma and quickly began to grow economically, socially and politically. In 1948, Burma became an independent state only to suffer under a Socialist regime in 1964. Since then, the country took a downward spiral, which saw the eventual decay of the capital city and the entire nation. Two other notable religious centers in the capital city are Botataung Pagoda and Sule Pagoda, which are located at the very heart of the city. Sule Paya (Pagoda) is older than Shwedagon Paya and was constructed primarily to enshrine the hair of Gautama Buddha. It is octagonal in shape with a pointy, golden tip that stands prominently in the middle of Rangoon traffic. While largely Buddhist, the city is also home to two important Christian churches, namely Saint Mary’s Cathedral, a Catholic cathedral, and Holy Trinity Cathedral, an Anglican cathedral built by the British. Meanwhile, other city attractions are the National Zoological Gardens that were built in 1906, Mahabandoola Garden, which is known best for its rose gardens, the Independence Monument, which is found inside the Mahabandoola Garden, the 130-acre-wide People’s Park, Inya Lake, Kandawgyi Lake also known as Victoria Lakes, and Bogyoke Aung San Park, just to name a few. There are several places to see and activities to do in Yangon. The city is also teeming with colonial buildings and interesting museums, such as the Defense Services Museum, Martyrs’ Mausoleum and National Museum. And to top it all, the locals are very friendly, always eager to help foreigners with directions and a hearty smile.